View More In Cups, Mugs & Saucers - Page 2. CLASSIC VINTAGE DESIGN: Made from glass, each mug comes with a beautiful vintage brown tag, handle, and classic tin lid to complement any event, room, picnic, or dining table it's a part of. Store your delicious beverages in style with these beautiful mason jars. CHALKBOARD LABELS INCLUDED: Looking to make party favors for family and friends? Look no further as each mason jar comes with its own chalkboard label for you to easily write messages and / or names as identifiers. The ball style mason jars work great for a multitude of purposes, including DIY candles, storing your favorite beverage, and more! LOOKS GREAT WITH COLD BEVERAGES: Whether you're making a cocktail (highly recommended) to drink, lemonade, beer, milkshakes, smoothies, jam, a candle, or simply serving water, you're guaranteed to impress your guests with these beautiful containers. The possibilities are endless! 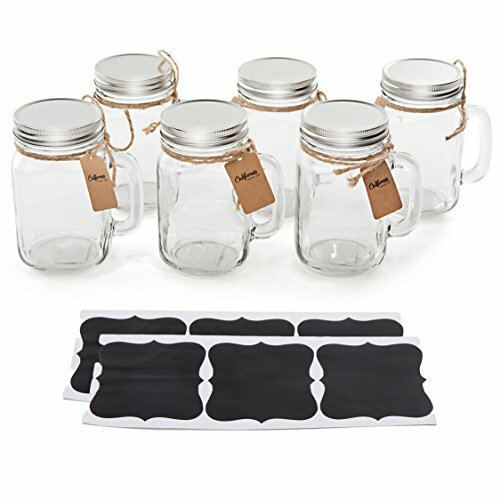 SET OF 6: Each set comes with 6 individually packaged mason jar mugs with a 16 ounce capacity, complete with mason jar lids. Do not serve hot water in these glass mugs. Each glass mug is 100% BPA and lead free. 30 DAY SATISFACTION GUARANTEE: Reach out to us if there's ever anything you need; we are dedicated to your satisfaction. Our factory warranty for products and add on items is only available from the authorized seller California Concepts.